You know, Doctor Who fandom is an interesting thing. You see sometimes we are intrigued by the old. We want to see the old actors in the new series, we like the big finish audios, and many of us yearn to see Tom Baker in the role again at any cost. Well, We have gotten that chance, and I must say the cost was high. Hornet's Nest: The Stuff of Nightmares brings Tom Baker back to the role of the Doctor, after many years. 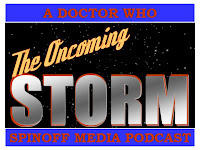 It was billed as a full cast audio, but instead we get some kind of awkward story told from the changing perspective of Mike Yates (reprized by Richard Franklin) and the Fourth Doctor. The story itself revolves around Taxidermied animals that come back to life and attack the doctor. The story is told by the doctor as he relays it to a now retired Captain Yates. I have to say that this story felt less like a Fourth Doctor Story and more of an adventure with Tom Baker. The Tom Baker of now. You see the Doctor is living in a country English Cottage, drinking a bit, and hitting on his house keeper. I had a hard time picturing the teeth, curles, and scarf of the doctor that so many of us grew up with, but instead pictured the modern day tom baker that was recently interviewed in Doctor Who Magazine. Which brings me to an interesting thought. Years ago Tom said that he had not came back to doctor who because he had not been presented with any decent material. He has said that scripts that big finish had presented him were sub par. If I'm not mistaken "The Holy Terror" was presented to him, and that story was NOT sub par. I think this also reflects some of the other non doctor who roles he has turned down over the past few years lets have a look at some of these. He was offered the role of Gandalf in the Lord of the Rings, and Dubledore in the Harry Potter Series, and turned them both down. Lets look at what he did choose to take on though. The Elf King in the Dungeons and Dragons movie. So this latest project is really not surprising. So, Will I listen to the others of the series. Yes. It wasn't a bad story, I just think you need to listen to it with an open mind. It is still Tom Baker doing new Who, and as I said in the beginning that is what all who fans crave!